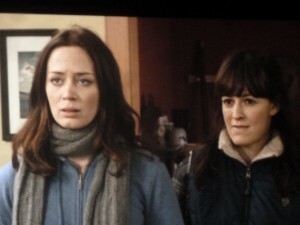 Mark Duplass, Emily Blunt, Rosemarie DeWitt, and Mike Birbiglia in "Your Sister’s Sister"
I get to see a lot of films before they hit the theatres and that is one of the perks of writing Comedy Matters for so many years. This week I had the pleasure of seeing Sundance award-winning filmmaker Lynn Shelton’s fourth feature film “Your Sister’s Sister”, and when I use the word “pleasure” I really mean it. The film was great! Interestingly enough when I heard the title it reminded me of Mike Birbiglia’s My Girlfriend’s Boyfriend, not knowing that he was even in this film. As the film opened on a group scene where friends gathered to remember their friend Tom who had passed away, it was all about Mike Birbiglia. He had the entire opening of the film, and it was great. 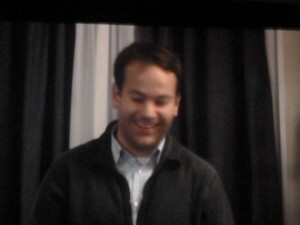 An unclear shot of Mike Birbiglia onscreen in “Your Sister’s Sister”, and I think he’s wearing his own clothes in this shot! 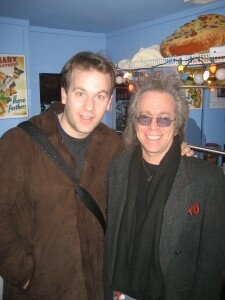 Jeffrey Gurian of Comedy Matters TV backstage with Mike Birbiglia when he first did “Sleepwalk With Me” back in 2008. Mike was recently in Sundance showing his own film “Sleepwalk With Me” which I saw when he did it live at the Bleecker Street Theatre. 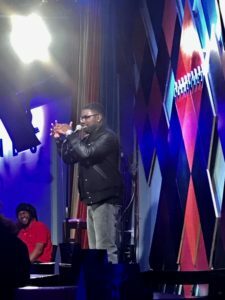 The New York Times called it “simply perfect”, and it was named “Comedy of the Year” by Time Out New York. 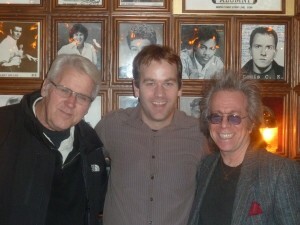 Richie Tienken, Mike Birbiglia, and Jeffrey Gurian at The Comic Strip after Mike filmed a scene for Sundance! 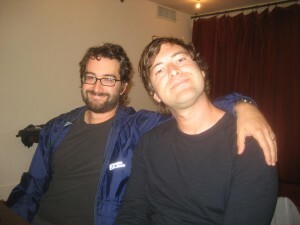 Mark Duplass is absolutely everywhere and for good reason. 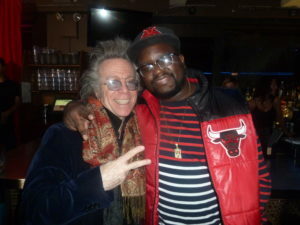 He’s incredibly talented, and he’s as nice as he is talented! 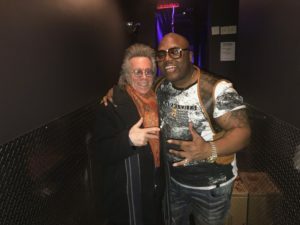 The first time I met him was at a press junket for the film Cyrus which he wrote with his brother Jay, and which starred Marisa Tomei, John C. Reilly and Jonah Hill. It garnered well deserved rave reviews. Jay Duplass with his arm around his brother Mark Duplass at the press conference for Cyrus their hit film starring Marisa Tomei, John C. Reilly and Jonah Hill! Mark Duplass and his wife Katie Aselton from The League, on the red carpet of The Comedy Awards, holding up four fingers to show me how many awards they were up for! When I was out in LA recently to shoot some sketches for Nick Kroll’s new show “The Nick Show Kroll” on Comedy Central, everyone on set was friends with Mark Duplass. Nick, as Ruxin, is one of the stars on FX’s hit show “The League”, and Mark and his wife Katie Aselton also star on that show as well. Mark is definitely everywhere you look these days, and deservedly so. In “Your Sister’s Sister” Mark plays Jack, the brother of Tom who died recently. Tom’s girlfriend Iris, played by the fantastic Emily Blunt, is Jack’s best friend and because he is emotionally spent she offers him her family cabin on an island in the Pacific Northwest so that he can just chill and get back to himself. 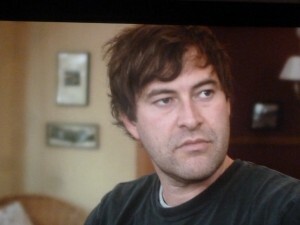 Mark Duplass in an on-screen close-up from “Your Sister’s Sister” opening June 15th, 2012! The cabin is supposedly empty, but when Jack arrives he finds Iris’s sister Hannah there, beautifully played by Rosemarie DeWitt, who just happens to be a Lesbian trying to get over the break-up of a 7 year relationship. 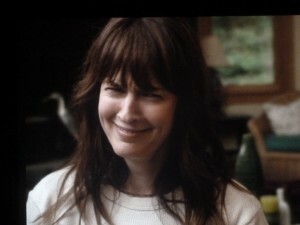 Rosemarie DeWitt in an onscreen moment, making a facial expression that makes her look like Diane Keaton in early Woody Allen movies. Tell me if you agree! They proceed to get really drunk and despite the fact that she has no interest in men, they wind up in bed together, with some really unpredictable consequences. I really loved this scene because I have been friends with some women of that proclivity and I could swear we had an attraction to each other, which I found both very freeing and kind of exciting. Things get even more complicated when Iris shows up unexpectedly the next day, and is thrilled to see her sister, but wonders how she and Jack spent the evening. I won’t tell you any more, because it’s too good, and I don’t want to spoil it for anyone. I understand a lot of the movie was improv’ed which is incredible because that is just so hard to do, but it tends to give you more of a real feel as opposed to someone who memorized all of their lines. It must be very draining especially during the confrontational scenes which are very powerful in this film. The film brought out some very interesting points to me, one of the most important being that you can have a terrible, all-out battle with someone you love, and if you step away from it for a few days, it tends to resolve itself. Sometimes distance is necessary to allow yourself to think clearly and to allow your heart to heal a little bit. This is a heart-warming, thoughtful film that definitely needs to be seen, so go out and see it! It opens on Friday June 15th. Don’t even wait till then, go figure out a way to see it tonight! Monday nights are usually kind of slow wherever you go. 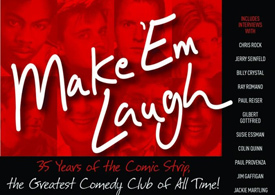 This Monday night The Comic Strip was sold out! Completely packed! People found out that Mike Birbiglia would be doing a 90 minute performance there and within no time the place was filled! (L-R) Richie Tienken, owner of The Comic Strip, Mike Birbiglia, and Jeffrey Gurian of Comedy Matters TV at The Comic Strip for a special taping for Mike’s film at Sundance! Back in 2008, Mike had a hit show with “Sleepwalk With Me” at the Bleecker Street Theatre. I was there for the opening and knew it would be a hit right away! Mike is an accomplished story-teller, which of course is an art form in itself! Very different from stand-up. 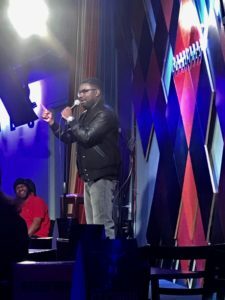 I can’t picture Mike doing a five minute set. I’m sure he could do it, but his material lends itself to longer pieces, so he can build his story in layers! 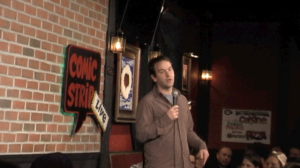 Mike Birbiglia as Matt Pentamiglio onstage at The Comic Strip! 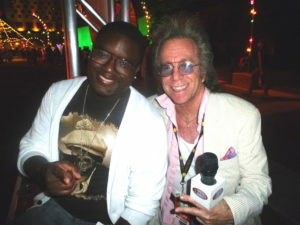 I caught up with Mike, … or Matt, … backstage at The Strip and did a little exclusive video interview for Comedy Matters! You can see that right here!